Question: Elucidate briefly on the problem associated with the two genealogies. Heli is the father-in-law of Joseph, cf. Lk 1:23. Answer: Two genealogies differ after David. While Matthew traces the line of David through Solomon giving the right to the royal (regal) line through Joseph (“the husband of Mary…”), Luke goes after the line of David through Nathan giving emphasis to the actual physical (legal) line through Mary. The sin of Solomon’s descendant brought a curse upon the regal line (Jer 22:24-30; 36:30). This is easily resolved because in fact, Jesus is not the actual son of Joseph, but merely his foster-son. In addition, Matthew clearly and carefully records that it is “Mary, of whom was born Jesus, who is called Christ” (Matt 1:16). 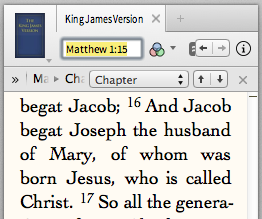 The problem in Luke is that Mary is nowhere to be found in Christ’s genealogy. This is also easily resolved in the fact that she is represented by Joseph her husband, “Joseph, which was the son of Heli” (Lk 1:23). Heli, the physical father of Mary, makes the father-in-law of Joseph.